A gateway is usually a gap between 2 fences with a gate in it..... But no, I jest! A Radio Gateway allows one radio to talk to another radio that is many many miles away through the power of ROIP (Radio Over IP). ROIP - similar to VOIP - sends the radio signal through the internet. When a user is in range of the gateway, the signal will be sent through the internet to other gateways in different places and users in range of those gateways will hear the signal and can reply back through their nearest gateway. Some people consider using gateways to be 'cheating' as the signal is going through the internet and not directly from antenna to antenna, but gateways enable contacts that would normally be impossible via direct RF, so they are very usefull. - Thats just the basics of what gateways are/do, you can probably find more indepth info on google, I'm gonna concentrate more on how to set one up on this page. 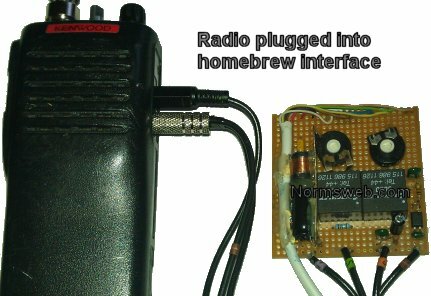 Basically all you need is a suitable radio (with antenna), an interface (to connect radio to computer) and a computer with internet access - thats it! A second radio is not strictly needed, but its pretty hard to set up the audio levels, test, and monitor your gateway without one. A very common question is: How much does it cost to set up a gateway? -The answer to this is: How long is a peice of string? The costs vary, you can set one up very very cheaply or you can spend mega-bucks. So, you want 2 radio's, an interface and a computer... The computer doesn't need to be anything special, as long as it has a soundcard and maybe a serial port (some interfaces do not need serial port). Your old out of date laptop in the attic, or an old scrapper PC bought from the local computer shop. Computer shops usually have to pay to dispose of old computers that people have traded in, so ask at your local computer shop and see what they say. I got an old pentium computer for £5. Its also possible to use your existing computer for the gateway, but not really recommended due to all the wires. So, thats the computer sorted, How much are the radios? -again, How long is a peice of string? The cost of the radio will depend on what frequency you wish to use... Top notch amateur radios can be over £1000 where as an old CB radio could be picked up for less than £20. PMR446 radios can vary from £13 for a chinese cheapy upto over £100 for a Kenwood or Icom brand. Second hand radios vary in price daily so its handy to keep an eye on auction websites, local auction houses, second hand shops and car boot sales. I found a pair of Kenwood TK361's at a local auction for £3 -yes £3! I couldn't believe it at the time, but no one else in the room wanted them, so you could say I got lucky that day! Right thats the 2 main bits sorted, now you need the interface to connect them together. How much? ..string? You could build your own very basic interface for less than £5 or a better quality one for maybe £10. If you don't fancy building your own interface you can buy one ready built. There are very expensive ham radio ones for over £100 (totally not needed, in my humble opinion) or decent ones which will be plenty adaquate for most uses from £30 - £50. My first interface was basic home built and cost about £4 I think. Also, it must not be forgot that it will use electricity to keep the gateway running and electric isn't cheap these days... My initial set up was using around 100 watts, which in these days of energy saving, is quite a bit. I'm now down to about 55 watts. That may not mean much to you, but just imagine leaving a 60 watt light bulb on 24/7. Ok, so you have amassed all the required bits and now you wanna set it up. Plugging it all in is pretty simple - just plug the interface into the computer, then plug the radio into the interface (I may go into that in more depth another time). Thats the easy bit, now you have to set up the PTT and audio levels. The settings you need to adjust/set up will depend on the gateway software you are using. 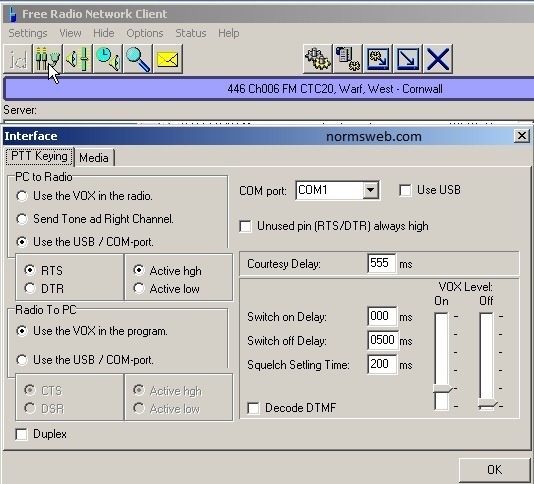 I'll be using FRN (free radio network) in this example simply because its what I use with my gateway, but a good idea for any gateway software is to start with all of the levels at mid position (radio volume, line in, line out on computer etc) and work from there. These settings will vary depending on the type of interface you use. The settings in the picture are the actual settings used on my gateway. PC to Radio determines what type of PTT interface you are using. The com port keyer interface can be made either active high or active low. Notice that my interface is set to active high, this is the ideal setting. If your interface is active low, then any fault on the computer can cause the radio to transmit. Once the interface has been bought or built, its not easy to change this so be sure to buy/build the correct one. Radio to PC will -in most cases- 'use the VOX in the program'. This is perfectly adaquate for most purposes, though you will need to spend some time setting up the VOX levels and delay settings. You can copy my settings and they should give you a good place to start. All gateway software will have some form of test room, parrot or echo room, and its a good idea to stay in the test room until you have got your settings sorted to avoid annoying other users of the gateway program. 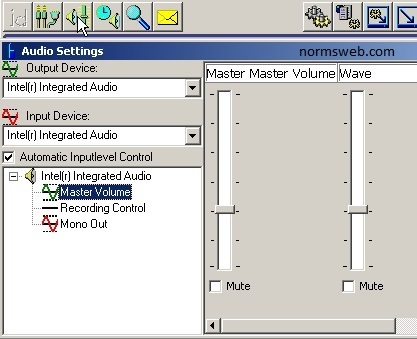 Start by setting up the audio from the computer to the radio, which will be 'Output Device' in the FRN program. The best way to do this is to start with all levels at about half. Tune into a network where people are talking. While listening on your second radio, adjust the 'wave out', 'master volume' or both until the audio you hear on your second radio is clear and not too quiet. Don't be too rushed, its good to listen to several different people as some will be loud and others will be quieter. Take your time and try to find a happy average. Once you are happy with the output levels, you can then start adjusting the input levels. To adjust the input levels you need to be in the test, parrot or echo room. Select 'Recording Control' and then select either line in or mic in whichever you are using and set the level to about half. Talk into your second radio and (in FRN) watch the audio level bar on the side. You want to aim for it to peak at about 75% of a full bar, adjust the line in or mic control until you achieve something near to this. Then release the PTT on the second radio and listen to the test room echo your signal back to you. Then talk again and listen to yourself, it should now sound pretty good. The reason we only peak it at 75% and not 100% is because if someone else uses your gateway and their radio is louder than yours, it won't over-deviate too much. Now you are all set, and can tune into your prefered network.